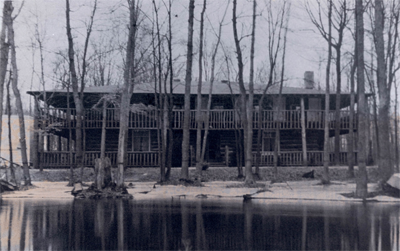 The Huron River Hunting and Fishing Club was organized as a non-profit sharing Club on June 14, 1923 by Eugene Rennard, who owned 153 acres “mostly woods” with two miles of river frontage on the Huron River, near Brighton, Michigan, five miles off Grand River Avenue. Hence the club name. Mr. Rennard built and financed a two-story log cabin, cutting all of the logs from the property. The cabin itself was 60 feet by 80 feet, including a ten foot screened porch, with twelve rooms upstairs, each with two doors, one opening from the hall which ran the full length of the building, and one opening to the porch. The kitchen was 20 feet by 25 feet, which we approached through a ten-foot breezeway. We cooked entirely on wood and coal. Three Delco units with 32 storage batteries, which were housed in the “Delco House,” 10 feet by 12 feet, which was about forty feet from the clubhouse, supplied electricity. Some of our older members remember when the Delco failed and all we had were candles and coal oil lamps, but we had some wonderful times just the same. However, the winters were very hard. The five miles of country road after leaving Grand River Avenue were very hilly and narrow and sometimes it would be days and days before we could get out for supplies. 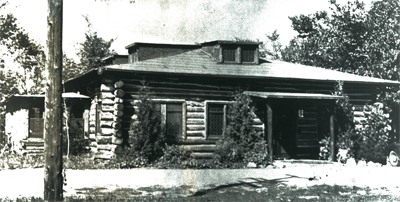 So in the fall of 1934, Mr. Rennard purchased the land in Farmington and started to build the second clubhouse. The logs were all cut from the farm and hauled out one or two at a time through the narrow and hilly road on a trailer with Rennard’s old Cadillac. In 1970 the present clubhouse was erected approximately 100 feet from the second clubhouse. The kitchen was remodeled in 1991 and the building was squared off in 1993. The most recent addition to the clubhouse was made during the summer of 2000. This included a new enclosed glass entry in the front and office and storage space in the back of the building. Mr. Eugene Rennard, Club founder, passed away in 1961, and Mrs. Rhoda Rennard in 1973. Since that time your elected officers and board of directors have made every effort to continue the atmosphere, quality of food and service and fellowship as begun by Mr. and Mrs. Rennard.